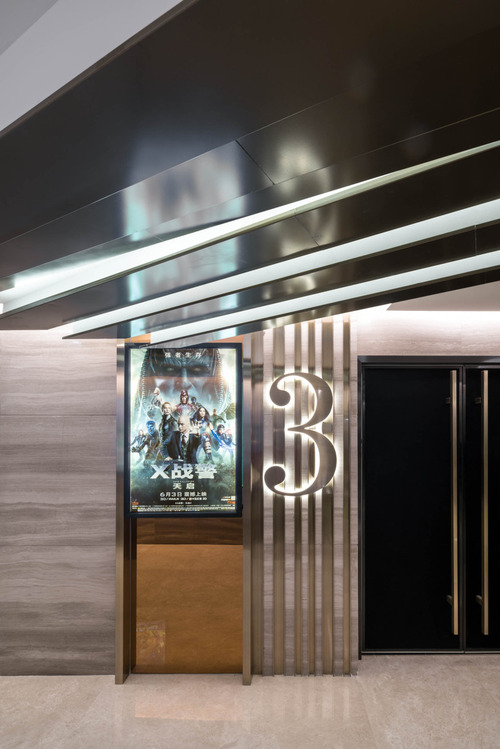 The closer customers getting to theatres, the higher ratio of black materials are applied in the interior, finally it becomes totally grey and black theme inside theatres; the geometric blocks features with wall lights are informing audiences that their trip to the universe has begun. The design with theme mentioned above is basically presented by fixture with gloss finished masonry that consists of several colours and streamline forms, which is aimed to use the brightness and contrast to present the perceptiveness and creativity in the future world. 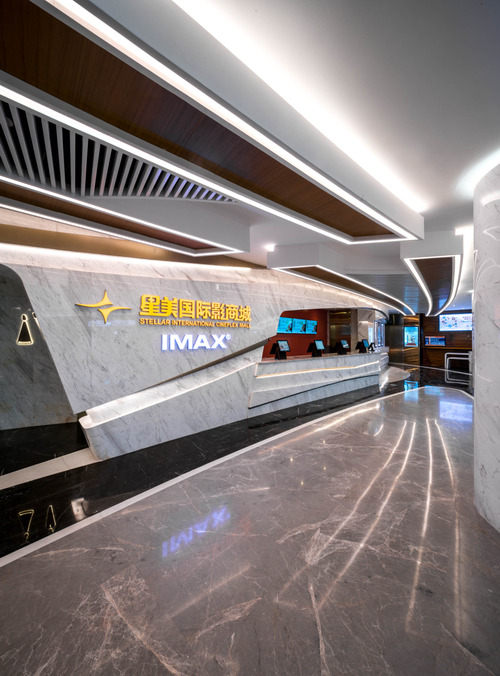 White and black marble finishes are applied all over the ticket box counter, walls and floor finish in order to create the contrast and brightness, as well as the paths for flow of movement by the horizontally circular setting and the zigzag setting on vertical planes. The monochrome and streamline application has also been put on the ceiling that is presented by the bulkheads and series of air con louvers. Along with long strips of LEDs inlay the lanes of ceiling features, efficiency of lighting and decoration has been pushed to the limit. The marble flooring patterns are actually guideline for the customers’ movement and action. 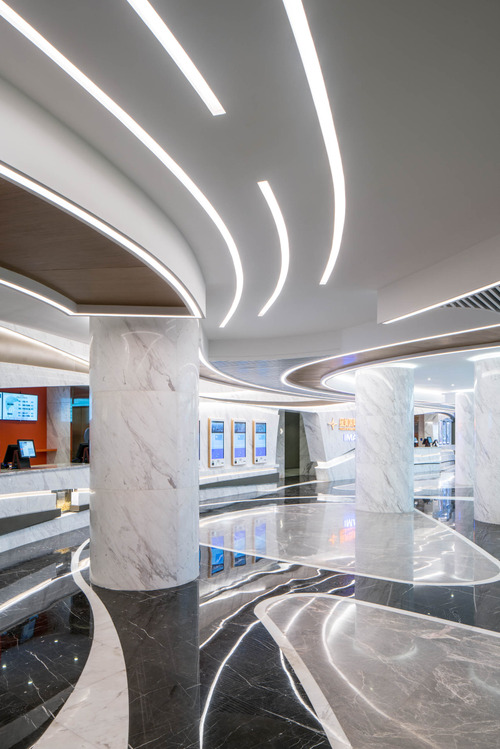 The interlocking curvy lanes of black and white marbles formed a set of tracks for customers to follow while moving forward to different areas inside the cinema. Meanwhile these tracks also assembled several sets of concentric circles that customers could gather and wait within, just like a minimized plaza. Just as kind of road marking in a space station, the paths pattern should be located even on the ceiling. The inorganic bulkheads, air con louvers and LED stripes took another roles of noticeable curvy paths that lead people to their destinations. 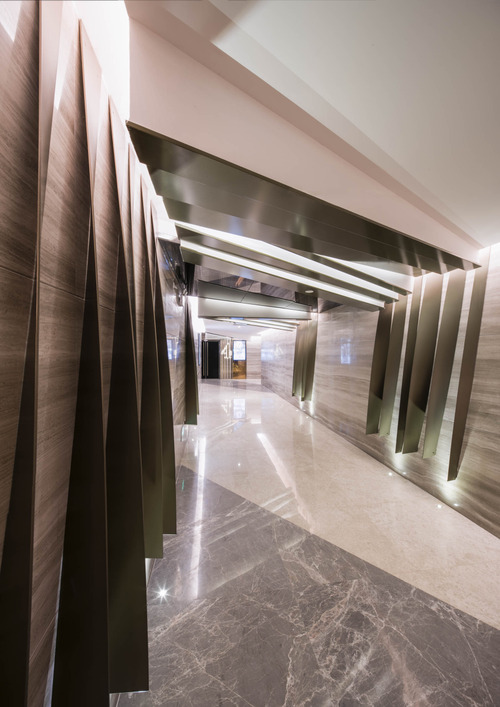 The geometric ticket box counter is the window that draws customers’ attention with the reflecting horizontal lines of marble finishes, thus customers are receiving the counter’s welcome messages in the first place. 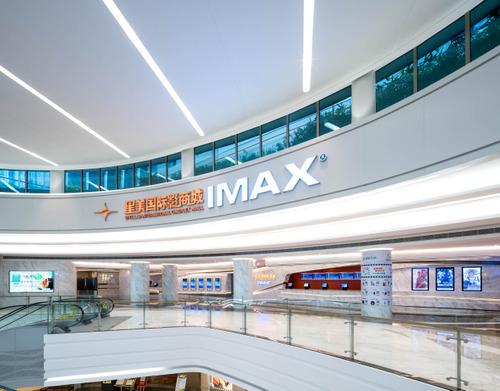 Communication between cinema and customers can be done by forms and colours. The project is finished in 2016 at Shenzhen, China.